Who’s going to watch and why? How is the production to be produced? Presenter driven, voice-over driven or a mixture of both? Lots of music or no music? Location based or studio based? Will the production be a studio discussion or will we be travelling the country telling the story? Punctuated with graphics or a does the programme just run its course? Many productions, especially those designed to stimulate discussion may be punctuated with summaries, which at those points, if shown in a group environment, the DVD can be stopped and a discussion ensues. We are highly experienced in producing television programmes, corporate productions and DVDs. Our project methodology is tried, tested and proven. The key to success is communication. We need to fully understand our client’s requirements and we turn those requirements into a professional video production. We fully appreciate that as the project gets underway the criteria may change as practical aspects of the production unfold. It is having the ability to be flexible that is another key to success. We produce many complex programmes that require careful pre-production and scheduling. We have a standard in-house budgeting software package that has been adapted to our requirements. It is important to utilise resources efficiently and cost effectively. Planning is the key to success. 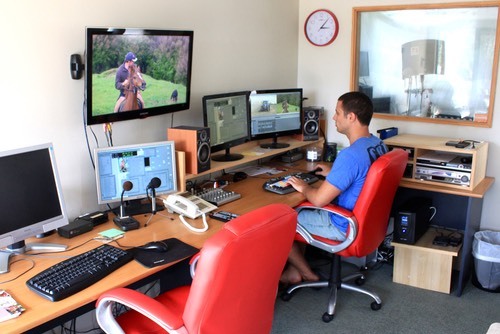 Once our programmes are shot on broadcast quality high definition wide screen equipment, the field footage comes to our edit suites and is ingested into the computer systems. We edit using the Avid editing system and once edited and approved a master file is produced. The master file then goes to our sound suite where the sound is treated, extra music, sound effects and voice over added. This sound track is now laid on to the master file. The master file goes to our DVD authoring suite where the menus for the DVD are produced, the programme is compressed and chapters added and so on. From this the mater DVD is produced. In the DVD suite we have four DVD copying machines and we normally copy up to 500 copies in-house. Longer runs are sent to a copying house. Our master DVDs are held in our DVD library so that further copies can be produced if required by the client. Slicks (the paper sleeve) for the DVDs are designed in house and printed to the highest quality at our printers. We can package DVDs in a number of ways; Standard clear library case, clam shell case (no slick) or a simple plastic sleeve (no slick). Changes are often required to projects but it is important for the client to be fully aware of the production process so that costs are kept to a minimum. The only limitations to changes are time and money. We keep the client informed throughout the production process with sign offs at key stages but we are fully aware that criteria may change along the way which will require more changes. We are happy to be flexible but it must be remembered that re-cuts cost money. We try to make all changes and get sign off before the production reaches the master output stage. Our creative approach is to first listen to the client. Once we have the brief then we bring it back to our offices and with the production team, talk through various possibilities for the programme. It’s a development stage. From this, ideas are drafted out, which usually involves using a large white board from which a shoot proposal is developed. This is the stage where a programme running order is produced which details the direction the programme will go and who is involved doing what on screen. This running order is then approved by the client. Once approved, a shooting script is developed and this details who, what and where is being filmed in the running order and what is being said. This will also include the draft linking voice-over script. The shooting script is then presented to the researcher appointed to the project who, with the director, will normally visit the locations and people involved ahead of the shoot to set up the filming. Days are agreed to film and the script, shooting schedule and running order finalised and signed off by the client. Filming then takes place. 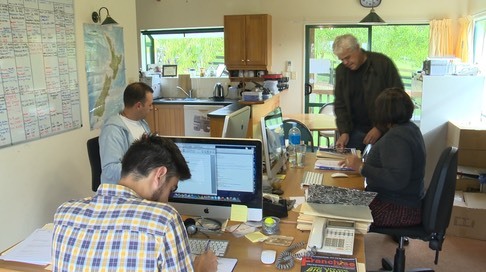 Any graphics for the production are usually worked on while the filming is taking place and all these creative elements come together in the edit suite once filming has been completed.